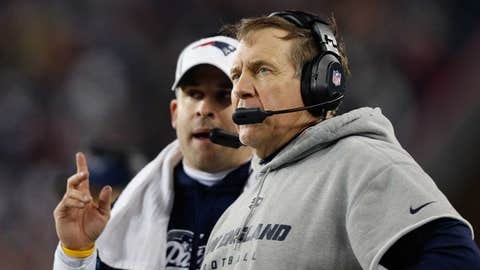 Patriots coach Bill Belichik (right) wouldn't comment on the Browns' interest in New England offensive coordinator Josh McDaniels (left). CLEVELAND (AP) — The Browns ended the year the same way they began 2013 — looking for a coach. The search is on. Again. The team will begin the interviewing candidates to replace Rob Chudzinski this week by meeting with New England offensive coordinator Josh McDaniels and Seattle defensive coordinator Dan Quinn. Chudzinski was fired Sunday after less than a year on the job, dismissed just hours after the Browns finished a 4-12 season with a loss in Pittsburgh. 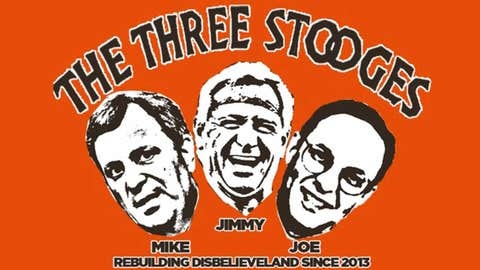 So owner Jimmy Haslam and CEO Joe Banner are back on the road trying to find a coach to lead the Browns from the darkness. Banner said the Browns will follow the same formula as they did before hiring Chudzinski, who wasn’t their first choice but won them over with a solid interview. "The idea of finding a coach that we’re confident can win, can take this group, see it as a group that has a strong nucleus, help together to figure out how to utilize the assets we have going into the offseason to take us to the next level," Banner said. "That’s the focus of what we’re going to try to find." The team received permission Tuesday to interview McDaniels, the former Denver head coach who appears to be the front-runner to become Cleveland’s seventh full-time coach since 1999 and fifth since 2008. Because the Patriots have an AFC playoff bye this weekend, the Browns are permitted to interview the 37-year-old McDaniels and will meet with him in the next few days. McDaniels was on Cleveland’s radar during their previous coaching search, but the Ohio native declined an interview request because he wasn’t ready to uproot his young family. McDaniels may now be ready for his second NFL head coaching stint. He went just 11-17 with the Broncos, but some of his issues were attributed to having to handle general manager duties as well. The Browns are very familiar with McDaniels. He has a long relationship with Cleveland GM Michael Lombardi, and Banner has identified McDaniels as one of the game’s bright, young minds. Not surprisingly, Patriots coach Bill Belichik wouldn’t comment on the Browns’ interest in McDaniels. "I’m not going to get into any of that," said Belichick, already in game mode despite not having one to prepare for this week. "The procedures are in place with the league and so forth. Any comments on that I don’t think are appropriate to come from me so I won’t make any." 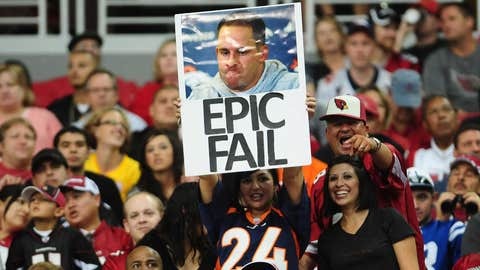 A Denver fan holds a sign related to fired head coach Josh McDaniels, who went just 11-17 with the Broncos. Quinn, too, is available to meet with the Browns this week because the Seahawks’ playoff game isn’t until Jan. 11. Seattle coach Pete Carroll was much more open when asked to talk about the 43-year-old Quinn, who in his first season with Seattle has turned its defense into one of the league’s best units. "Dan is a terrific football coach," Carroll said. "He’s got a tremendous background in the game. He’s got great character about the game. He’s a great communicator. He’s tough. He knows what he wants. Just look at how well he transitioned to take this thing over so quickly and seamlessly. Getting along with people, working with people and also managing the talent. All of that, he’s really well equipped." The Browns have also requested permission to interview Arizona defensive coordinator Todd Bowles and Broncos offensive coordinator Adam Gase, who declined the request until after Denver’s season is over. Other potential candidates for the Browns include former Detroit coach Jim Schwartz and Cincinnati offensive coordinator Jay Gruden. Banner said the Browns will not interview any candidates they met with on the last go-around, but that could change if Houston doesn’t close the deal with Penn State coach Bill O’Brien. Despite the appearance of turmoil in Cleveland, Haslam believes the Browns’ job is appealing. "I feel confident that we’re going to be able to convince people that this is not a good, but a great place to coach, where they’ll have great support and everything they need to be successful," he said. "Now, talk is cheap and we’ll know a year from now, two years from now or maybe six months from now if we’re successful at that."